The working president of Telangana Pradesh Congress Committee Revanth Reddy has fumed on the media for making baseless allegations on him from the past few days and named certain news channels like TV9, T News and Namaste Telangana to admit their fault on their baseless coverage of programmes all the day and gave them a deadline of 24 hours to express their unconditional apology to him. He also demanded the certain news channels to publish the retraction story in the same way they’ve published his baseless allegations round the clock. Revanth also made it clear that if they don’t respond in the deadline of 24 hours he will drag everyone to the court. 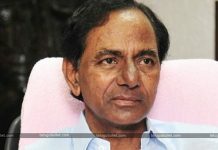 Revanth has expressed his pain saying that it’s KCR and his family who is behind this and they’ve even aired hours of news displaying the account numbers and stating that Revanth has multiple bank accounts in Malaysia, Bangkok and several other places. Revanth has expressed his agony saying that the IT officers have harassed him based on the false news aired mainly by these three news channels (on 27, 28, and 29 of this month)which were acting as puppets to KCR according to him. He finally gave a deadline of 24 hours on this regard to give their unconditional apology in the way directed by him.